Posted on October 9, 2017 , in Hot Tubs. Keeping your hot tub water clean and healthy is paramount to a good hot tub experience. Learning to recognize and correct hot tub water problems will give you peace of mind and a relaxing soak. The most commonly identified issues are cloudy, milky or foamy water. This article allows you to pinpoint and correct these problems. Cloudy water occurs when it appears there are particles floating in it, but they aren’t large enough to scoop or filter out. Unbalanced pH levels or filtration problems are usually the cause of water cloudiness. Using a pH testing kit will tell you if your water is too acidic or alkaline. Bring the pH back into balance depending on your test results. This may be all that’s needed to clear up your water. Cleaning or replacing your filters will also help in clearing up cloudy water. Filters should be rinsed with fresh, running water weekly, doused in a chemical solution monthly and completely replaced every year or two. Shocking refers to adding cleaning solutions to the water and allowing them to filter throughout the entire system. Typically done at the beginning of a new season, it can also bring back your water to a clear state whenever it appears cloudy. Shocking will remove organic compounds, kill bacteria and neutralize harmful compounds while activating helpful compounds. Shocking solutions can be chlorine based which disinfect and oxidize but are harder on the hot tub components and should be used sparingly. There are also non-chlorine based shocking solutions which oxidize but don’t disinfect but can be used more regularly. If all else fails, you’ll need to empty the tub, give it a good cleaning and refill it with fresh water. Milky water refers to a whitish color that doesn’t allow you to see the bottom of the tub. This can also result from poor water chemistry, faulty water filtering or heavy hot tub use. As with cloudy water, the steps needed to correct it are testing the water, checking and cleaning the filter systems, shocking the hot tub and, if necessary, emptying and cleaning the tub manually. If there appears to be a buildup of foam that floats on the water surface or lines the edge of the hot tub, a cleaning regimen will be necessary. Typically caused by detergents or the reaction of alkaline water with makeup, deodorant or body oils, you might be able to prevent it in the first place by showering before entering the tub or not dunking your hair in the water. However, if a cleaning agent is needed, there are anti-foamers or enzyme based cleaners that can provide a quick solution. These won’t solve the problem but make a good temporary fix. The most effective way to eliminate foamy water is to drain the tub completely and give it a good cleaning. Dealing with cloudy, milky or foamy water is part of owning a hot tub. Both preventative and maintenance procedures will help rectify the situation and return your water to a crystal clear state. Maintaining clean water conditions will reduce the wear and tear on the various hot tub components while giving you the peace of mind while relaxing in the warm waters. 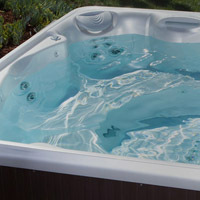 Now that you know what the main causes of hot tub water problems are and how they can easily be fixed, learn more about the many options we have available by downloading a hot tub buyer’s guide.